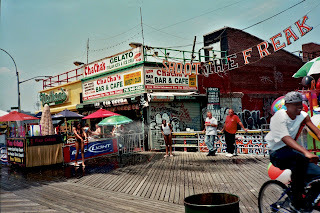 + THIS IS PRETTY MUCH CONEY ISLAND CAPTURED IN ONE FRAME. THE ONGOING PROJECT OF THE REDEVELOPMENT AND REVIVAL OF CONEY ISLAND IS ONE THAT CANNOT START FROM SCRATCH. THE PEOPLE IN THIS PICTURE TAKE A CERTAIN PRIDE IN WHO THEY ARE, AND HOW THEY CAN EXPLOIT THEMSELVES ON ANY LEVEL AT CONEY ISLAND, SOMETHING THEY CANNOT DO ANYWHERE ELSE. THIS EVIDENT PRIDE NEEDS TO BE KEPT IN ORDER TO KEEP THE NAME OF CONEY ISLAND, AND THE PURE THRILL TO ENJOY A DIFFERENT LIFESTYLE AND TYPE OF BEHAVIOR.